I have joined the 21st century and inherited an iphone (the high-minded Mr Tabubil having moved on to Android and gleefully jettisoned his apple object in my direction) and I am having rather more fun than I ought to be having. There are lots of lovely, gimmicky camera-type apps out there, and I'm trying them all. Isn't it amazing how the right sort of retro styling can make the most banal photograph look a little artsy? A crane on a barge came steaming up the river this evening, with a tug pushing it and another one riding postillion, and anchored just upstream of our marina. "D'you reckon it's here to salvage the boat on the boardwalk?" Mum and I walked down to the riverbank to have a look. We met a man emptying a shopping cart full of sandbags into a garden bed. "Ahem." Mum cleared her throat tentatively and spoke to him. "Is that SAND you're placing on top of those bushes?" "Yep. The beds lost all their topsoil in the flood. Got washed out." "And you're sure" she said delicately, "that sterile sand is the best replacement for topsoil?" "I was told to dump all of my bags in here. Presumably the city knows what it's doing. I’M not a gardener." Mum met my eyes and shrugged expressively. 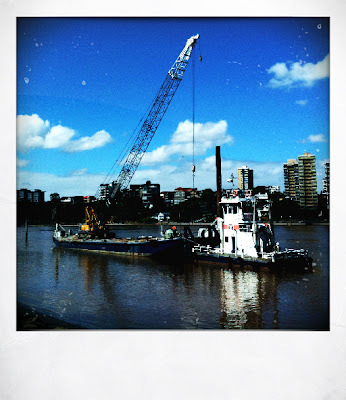 "We were wondering if you'd know what the barge and crane were here for." She said. 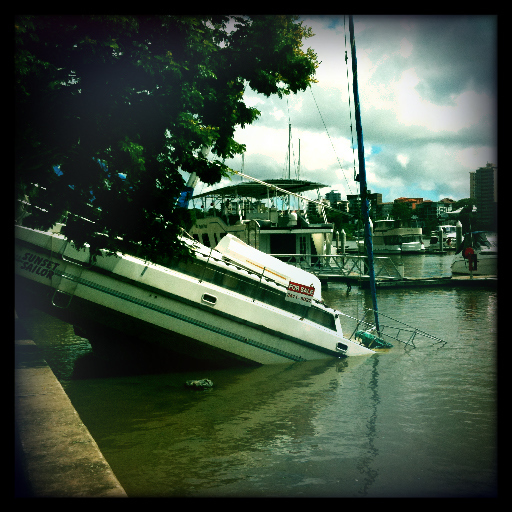 "We thought it might be here for the boat that's beached just down in front of our place." "My god! Were you worried?" He shrugged. "I was pretty philosophical about it, tell the truth. I'd emptied the unit before the floods got here. I mean I took EVERYTHING, down to the carpets -"
"How did you have the time to do all that?!" "We had about 36 hours notice before it hit. And we had help." He looked out at the water, shaking his head. "People I'd never met, people I'd never seen in my life - they just showed up and they carried things. All I had to do was organize, but when you're in a situation like that, you can't stop. The adrenalin is so strong. Think I went for forty hours before I dropped and slept." "Where'd you store your belongings, then?" "With friends who lived above the floodline. They brought trailers and took it away with them. The stuff we couldn't carry away we took upstairs and piled in the back rooms of apartments on the second and third floors." "They filled up their houses for you." He smiled quietly. "They did. 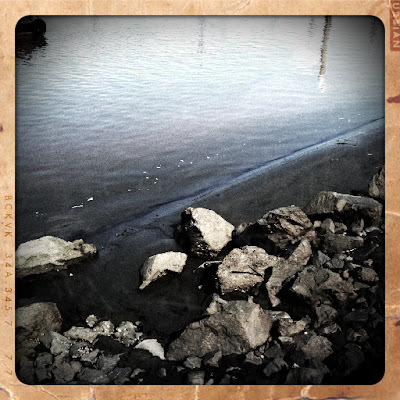 And then the water came up to fifty centimeters from our front door and it stopped." "Thanks. I sat there in our empty living room and watched that river rise up. I must have seen five hundred boats come past - upside down, half wrecked, half sunk, all smashed together - the sound of it - did you know that rivers that flood have a sound?" "I've seen rivers in flood." "Then you know. It roared. 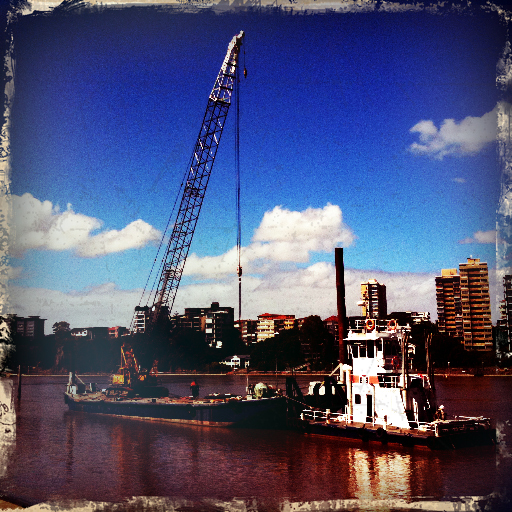 The river today -" he waved his hand at it, "it's…still. Nothing there. That river sounded like a freight train. A storm. A terrible storm. And it carried all those boats with it and smashed them into the pilings of the jetty. Some must have gone down here. That's what I reckon the barge is for. They're going to haul up the sunken boats. " We looked at the barge, impressed. "2011 is going to be a big year for Australia, I reckon." The man said to us. "Floods, bushfires, cyclones, weather changing everywhere - I don't know where you stand on this global warming thing-"
I put on an American accent. "Why, sir, it was so cold last week I actually had to run my heater in the evening. Obviously, there ain't no such THING as global warming!" "Exactly!" He said forcibly. "It's a CROCK! It's all about making MONEY, not about the planet. What's wrong with the planet? Did you know that it takes 200 YEARS to change the weather? It's a fact! We can't be doing anything because if we were, it wouldn't show up for two centuries! Tell me, what were we doing 200 years ago?" I blinked. "Er, the steam engi -"
"Weather changes. That's all. Cycle of nature. The glaciers are melting - that's normal. Because it's ONLY happening in the northern hemisphere! And so what? It's getting colder down here in the southern hemisphere, that's what - did you know that Antarctic sea ice is INCREASING? They don't tell you THAT, do they? They leave that out!" "Um." I said carefully. "I'd understood that the ice was increasing because the hold in the ozone layer has grown? That can't be good. And we did do that, didn't we?" He snorted. "CFCs - LIES. Green light bulbs, catalytic converters - they've got NOTHING to do with the environment! It's about making money!" Mum was appalled. "But even if you don't believe in global climate change, don't you care about quality of life? Isn't it NICER to have clean water? Even if you don't think the climate is changing, isn't it NICE to have air you can breathe, instead of full of car fumes?" "There's no science there." He glowered at her. And then, like fundamentalists of all stripes, he tracked invention and prejudice into a diatribe so far removed from conversation that we…. left. I've always been bemused by global conspiracy types. In my experience, it's impossible to get ten unrelated people to sit down for coffee and cough up the right amount of change when the bill arrives, or agree who ate the larger portion of the cream-puffs. God (speaking metaphorically, I'm sure) knows how the putative OWG is supposed to be coaxing a planet full of bloody minded scientist types into toeing a line they know to be untenable. Occam's razor and all that; I merely note that our recognized terrestrial governments have not, historically speaking, had any more success keeping a lid on special interest groups than I have had coordinating morning tea. Others know best, I'm sure. It's probably a deep-cover cover-up.